The motor yacht Destiny (now Ocean Glory) was designed by James Rennie Barnett of G.L. Watson & Co. and built by Yarrow & Co. in 1935. After 72 years sailing, she was acquired in 2003 by Amico & Co of Italy where she underwent a full and impressive restoration resulting in a great reception at the 2007 Monaco Yacht Show. The success of the refit of Ocean Glory underlines the attractiveness of restored and re-built G.L. Watson designs. 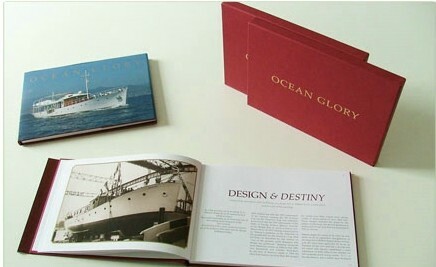 The history of Ocean Glory and her remarkable restoration story have been recorded in a new book. The book draws from the archival material provided by the G.L. Watson Archive and is available for purchase by writing to:info@myoceanglory.com. Please click to visit the Ocean Glory Website.